Recently we have arranged No More Hiroshima: No More Nagasaki: Peace Exhibition in India. Which is directly concern to Human rights, basic and most important Right to Life. 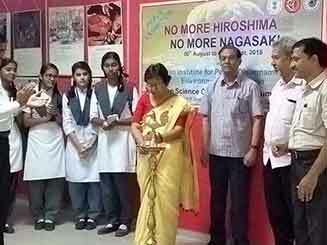 As a member of IEIP , We have arranged event on disarmament 'No More Hiroshima: No More Nagasaki: Pace Exhibition" In India. I am submitting short report of our activity for your information. No More Hiroshima: No More Nagasaki: Peace Museum and Raman Science Centre arranged No More Hiroshima: No More Nagasaki: Peace Exhibition from 6 to 19 August at Raman Science Centre and Planetarium, Ministry of Culture , Government of India. Peace Exhibition inaugurated on 6th August by Project Director of Raman Science Centre and Planetariums Mr. Ramadas Ayyar. Peace exhibition was open to public from 6 to 9 August but due to heavy rush and demand from public the dates are extended upto 19 August 2018. Dr. Balkrishna Kurvey, Honorary Executive Director of No More Hiroshima: No More Nagasaki: Peace Museum and President of IIPDEP address the delegates on 2 Billion People will at Risk. He explained the catastrophic effects of a nuclear war with the help of Hiroshima and Nagasaki bombing photos. Limited nuclear war between India and Pakistan 1 billion will die due to starvation and another 1 billion will also be affected. 2 billion people will be affected but also change our climate lead to crop failure. Malnutrition, fuel crises and spread of infectious diseases in global South and in world. If America and Russia will engage in a nuclear war then about 100 million people will die instantly and only 20% people will remain on earth Even they will have very less chances of survival due to nuclear radiation. . He also appealed for teaching values of non-violence to students as well as to people. With the help of Peace Museum around the world we can build public opinion towards nuclear weapons free world. :Animation film,On Peace Crane: depicting the life of atomic bomb victim girl Sadako was screened for students and public. He informed the work of EIP on Human rights and disarmament. Dr Nalini Kurvey member of International Physicians for Prevention of Nuclear War and President of EIP, India said how Openheimer develop the nuclear bombs and its testing in New Mexico desert and how bombs were dropped on Hiroshima and Nagasaki. This subsequently led to a nuclear arms race. There are no medical remedies for nuclear bombs victims and prevention in only cure to save the human race, environment and planet earth from the horrible catastrophic effects.She narrated the work of IPPNW and EIP world wide for Human rights training and nuclear weapon free world.